From the couture designer wedding dress to the over-the-top d&#xE9;cor and top-secret locations, celebrities knows how to get married right. And while they can be quite far-fetched (or even short-lived), an A-lister's big day remains etched in fans' brains for years to come. Celebrity weddings have been closely followed for decades. Most recently, Kim Kardashian and Kanye West's Florence nuptials were as lavish as they come. Case in point: In lieu of place cards, guests' names were rumored to have been etched into a marble. Plus, who can forget Kim's now-iconic custom Givenchy gown? Also, George Clooney and Amal Alamuddin's wedding weekend was closely followed for a few reasons: Not only did a self-proclaimed eternal bachelor finally take the plunge, but also Amal's bridal wardrobe was just as captivating. And then, there are unions like Britney Spears and Kevin Federline and Pamela Anderson and Tommy Lee &#x2014; these couples' crazy celebrations have remained in infamy for years even though their marriages quickly ended. Of course, we can't forget about the royals either. From Kate Middleton's Alexander McQueen wedding dress to Grace Kelly's big-day ensemble, which has remained a pillar of bridal beauty for over 50 years, these are the moments define wedding-day trends for decades to come. To stir up some serious nostalgia and wedding-envy, we went back decades to bring you the most memorable celebrity-wedding moments of all time. Sit back, relax, and re-live these incredible celebrity "I dos" (and wedding dresses!) from the past century. Witney Carson marries Carson McAllister on New Year's Day in Rivini, 2016. Sopranos star Jamie Lynn Sigler marries Cutter Dykstra in Oscar de la Renta, 2016. TV host and transgender icon, Janet Mock, marries Aaron Tredwell in Hawaii, 2015. Whitney Port marries Tim Rosenman in a high-low wedding dress by Ashi Studio, 2015. Sofia Vergara marries Joe Manganiello at The Breakers Resort in a Zuhair Murad gown, 2015. Jamie Chung marries Bryan Greenberg on Halloween in Monique Lhuillier, 2015. Jenni "JWoww" Farley marries Roger Mathews in a custom lace Ysa Makino ball gown with a 10-foot train, 2015. Girls star Allison Williams marries Ricky Van Veen in Oscar de la Renta, 2015. Sports Illustrated model Bar Refaeli marries Adi Ezra in a bohemian Chloé gown, 2015. Vanessa Williams marries Jim Skrip on July 4, in an Egyptian-inspired wedding, 2015. Nicky Hilton marries James Rothschild in Valentino, 2015. Beatrice Borromeo marries Monaco Royalty Pierre Casiraghi in Valentino, 2015. Jennie Garth marries David Abrams in Claire Pettibone, 2015. Alison Pill marries Joshua Leonard in a retro yellow dress, 2015. Geri Halliwell marries Christian Horner in Sarah Burton for Alexander McQueen, 2015. Kim Sears marries Andy Murray in Jenny Packham, 2015. Nikki Reed marries Ian Somerhalder in Claire Pettibone, 2015. Tina Knowles marries Richard Lawson in Romona Keveza, 2015. Sophie Hunter marries Benedict Cumberbatch in Valentino, 2015. Bachelorette Desiree Hartsock marries Chris Siegfried in Maggie Sottero, 2015. Amal Alamuddin marries George Clooney in Oscar de la Renta, 2014. Lauren Scruggs marries Jason Kennedy in Romona Keveza, 2014. Solange Knowles marries Alan Ferguson in Stephane Rolland, 2014. Lauren Conrad marries William Tell in Monqiue Lhuillier, 2014. Amber Stevens marries Andrew J. West in CB Couture, 2014. Ashley Tisdale marries Christopher French in Monique Lhuillier, 2014. Angelina Jolie marries Brad Pitt in Atelier Versace, 2014. Gabrielle Union marries Dwyane Wade in Dennis Basso, 2014. Jenny McCarthy marries Donnie Wahlberg in Ines Di Santo, 2014. Ashlee Simpson marries Evan Ross in Houghton Bridal, 2014. Jessica Simpson marries Eric Johnson in Carolina Herrera, 2014. Naya Rivera marries Ryan Dorsey in Monique Lhuillier, 2014. Olivia Palermo marries Johannes Huebl in Carolina Herrera, 2014. Bachelorette Emily Maynard marries Tyler Johnson in Modern Trousseau, 2014. Poppy Delevingne marries James Cook in Chanel, 2014. Kim Kardashian marries Kanye West in Givenchy, 2014. Savannah Guthrie marries Michael Feldman in Monique Lhuillier, 2014. Stacy Keibler marries Jared Pobre in Monique Lhuillier, 2014. Catherine Giudici marries Bachelor Sean Lowe in Monique Lhuillier, 2014. Kaley Cuoco marries Ryan Sweeting in Vera Wang, 2013. Kelly Clarkson marries Brandon Blackstock in Temperley Bridal, 2013. Chrissy Teigen marries John Legend in Vera Wang, 2013. Kristin Cavallari marries Jay Cutler in Monique Lhuillier, 2013. Keira Knightley marries James Righton in Chanel, 2013. Shenae Grimes marries Josh Beech in Vera Wang, 2013. Bachelorette Ashley Hebert marries JP Rosenbaum in Randi Rahm, 2012. Amber Tamblyn marries David Cross in a marigold yellow dress, 2012. Jessica Biel marries Justin Timberlake in Giambattista Valli, 2012. Anne Hathaway marries Adam Schulman in Valentino, 2012. Natalie Portman marries Benjamin Millepied in Rodarte, 2012. Hilaria Thomas marries Alec Baldwin in Amsale, 2012. Drew Barrymore marries Will Kopelman in Chanel, 2012. Camila Alves marries Matthew McConaughey in Ducarmo Castelo Branco, 2012. Lauren Bush marries David Lauren in Ralph Lauren, 2011. Molly Sims marries Scott Stuber in Marchesa, 2011. Sofia Coppola marries Thomas Mars in Azzedine Alaïa, 2011. Vanessa Minnillo marries Nick Lachey in Monique Lhuillier, 2011. Kate Moss marries Jamie Hince in John Galliano, 2011. Lily Aldridge marries Caleb Followill in Vera Wang, 2011. Reese Witherspoon marries Jim Toth in Monique Lhuillier, 2011. Kate Middleton marries Prince William in Alexander McQueen, 2011. Alicia Keys marries Swizz Beats in Vera Wang, 2010. 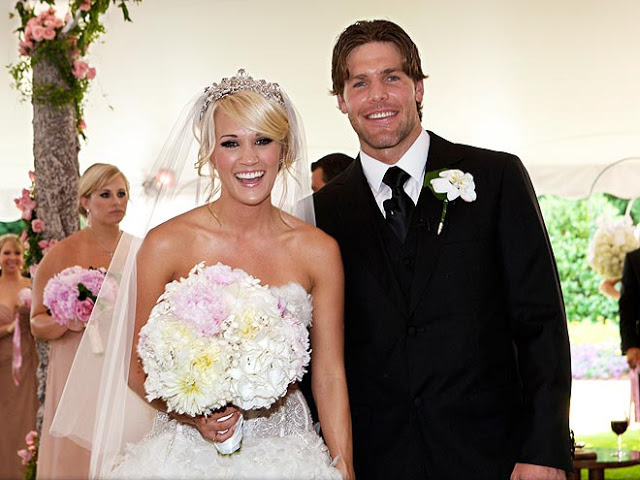 Carrie Underwood marries Mike Fisher in Monique Lhuiller, 2010. Lala Anthony marries Carmelo Anthony in Vera Wang, 2010. Chelsea Clinton marries Marc Mezvinsky in Vera Wang, 2010. Megan Fox marries Brian Austin Green in Armani Privé, 2010. Coco Rocha marries James Conran in Zac Posen, 2010. Ivanka Trump marries Jared Kushner in Vera Wang, 2009. Khloé Kardashian marries Lamar Odom in Vera Wang, 2009. Salma Hayek marries Francois-Henri Pinault in Balenciaga, 2009. Gisele Bundchen marries Tom Brady in a body-skimming sheath, 2009. Fergie marries Josh Duhamel in Dolce and Gabbana, 2009. Portia DeRossi marries Ellen DeGeneres in Zac Posen, 2008. Jenna Bush marries Henry Chas Hager in Oscar de la Renta, 2008. Beyoncé marries Jay-Z in a white strapless sweetheart gown, 2008. Giuliana Rancic marries Bill Rancic in Monique Lhuillier, 2007. Rebecca Romijn marries Jerry O'Connell in Ralph Lauren, 2007. Katie Holmes marries Tom Cruise in Giorgio Armani, 2006. Nicole Kidman marries Keith Urban in Balenciaga, 2006. P!nk marries Carey Hart in Monique Lhuillier, 2006. Dita Von Teese marries Marilyn Manson in Vivienne Westwood, 2005. Britney Spears marries Kevin Federline in Monique Lhuillier, 2004. Julia Roberts marries Daniel Moder in Judith Beylerian, 2004. Julianne Moore marries Bart Freundlich in Prada, 2003. Elizabeth Banks marries Max Handleman in Christian Dior, 2003. Jessica Simpson marries Nick Lachey in Vera Wang, 2002. Gwen Stefani marries Gavin Rossdale in John Galliano for Dior, 2002. Claudia Schiffer marries Matthew Vaughn in Valentino, 2002. Madonna marries Guy Richie in Stella McCartney, 2000. Jennifer Aniston marries Brad Pitt in Lawrence Steele, 2000. Victoria Adams marries David Beckham in Vera Wang, 1999. Courteney Cox marries David Arquette in Valentino, 1999. Cindy Crawford marries Rande Gerber in John Galliano, 1998. Jada Pinkett marries Will Smith in Badgley Mischka, 1997. Sarah Jessica Parker marries Matthew Broderick in Morgane Le Fay, 1997. Faith Hill marries Tim McGraw in a white sheath gown, 1996. Carolyn Bessette marries John F. Kennedy, Jr. in Narciso Rodriguez, 1996. Kelly Ripa marries Mark Consuelos, 1996. Iman marries David Bowie in Chanel Haute Couture, 1995. Pamela Anderson marries Tommy Lee in a white bikini, 1995. Celine Dion marries Rene Angelil in Mirella and Steve Gentile, 1994. Mariah Carey marries Tommy Mottola in Vera Wang, 1993. Whitney Houston marries Bobby Brown in Mark Bouwer, 1992. Michelle Robinson marries Barack Obama, 1992. Rita Wilson marries Tom Hanks, 1988. Diana Ross marries Arne Naess Jr. in a pearl-embroidered dress with antique Belgian lace, 1986. Heather Locklear marries Tommy Lee, 1986. Caroline Kennedy marries Edwin Schlossberg in Carolina Herrera, 1986. Christie Brinkley marries Billy Joel in Norma Kamali, 1985. Sharon Arden marries Ozzy Osbourne in a high neck lace gown, 1982. Diana Spencer marries Prince Charles in David and Elizabeth Emanuel, 1981. Hillary Rodham marries Bill Clinton in Jessica McClintock, 1975. Bianca Perez-Mora Macias marries Mick Jagger in Yves Saint Laurent, 1971. Yoko Ono marries John Lennon, 1969. Linda Eastman marries Paul McCartney, 1969. June Carter marries Johnny Cash in a light blue short lace dress, 1968. Priscilla Beaulieu marries Elvis Presley, 1967. Mia Farrow marries Frank Sinatra, 1966. Elizabeth Taylor marries Richard Burton in Irene Sharaff, 1964. Brigitte Bardot marries Jacques Charrier in a gingham Jacques Esterel minidress, 1959. Julie Andrews marries Tony Walton in a wedding dress of his design, 1959. Elizabeth Taylor marries Eddie Fisher, 1959. Grace Kelly marries Prince Rainier III in Helen Rose, 1956. Marilyn Monroe marries Joe DiMaggio, 1954. Audrey Hepburn marries Mel Ferrer in Pierre Balmain, 1954. Jacqueline Bouvier marries John F. Kennedy in Ann Lowe, 1953. Ava Gardner marries Frank Sinatra in a halter neck wedding dress, 1951. Queen Elizabeth II marries Prince Phillip in Norman Hartnell, 1947. Love celebrity weddings? Don't forget to Pin this!